Mangoldt is pleased to announce the release of their new website. We have been busy with the day-to-day activity of reactor manufacturing and overlooked updating our website, until now! Electrical reactors made by Mangoldt are the standard in the electrical industry with their precision and reliability, offering the most reliable and economical solution for our customers! Mangoldt offers exclusive PolyGap® core construction for minimum stray flux, minimum losses due to harmonics, and precise, balanced inductance in all three phases. 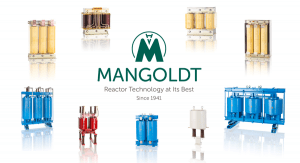 Mangoldt specializes in reactors built to withstand harmonics and PWM voltages especially for harmonic filters, PWM to sine wave filters and filters applied between the active front end (AFE) and the power system (Grid). Low and medium voltage reactors available. We are here to help with all your reactor needs. Any Questions? Feel free to contact us by phone or e-mail. Our goal is to help you solve or prevent power quality problems. Just call to ask about our power quality services or to discuss your power quality concern. Allied Industrial Marketing your Mangoldt Authorized Technical Sales Office.